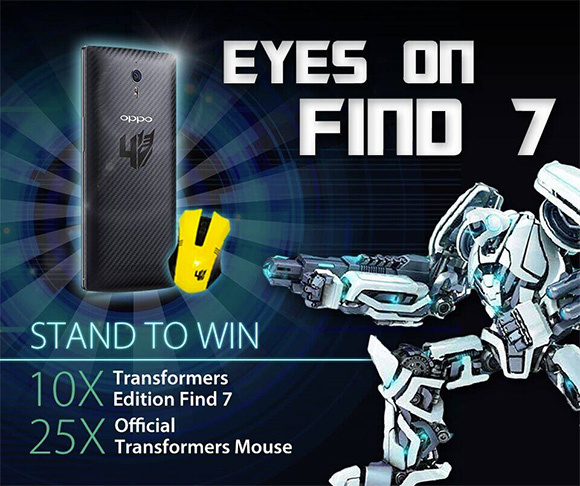 Oppo is holding up a giveaway offering you the chance to win one of twenty four Find 7 Transformer Edition smartphones. The campaign is lead by Oppo Vietnam and is available for anyone around the world to participate. All you have to do is follow the source link below and play the game. The rest of the prizes are also cool. Oppo has prepared 40 Transformers-styled PC mice with a yellow paint job and 25 limited edition Transformers 3D glasses. The company will announce the winners on its Facebook page two weeks from now. The phone comes with a 5.5" IPS display of QHD resolution, plus it runs on the fastest Snapdragon 801 chipset with a quad-core Krait 400 CPU @2.5GHz and 3GB of RAM. You will be also getting 32GB internal storage and stereo speakers. Yes I won one, but I still haven't received it.